webOS is moving up to version 2.0 and bringing along with it a whole host of new features sure to please even the most jaded of webOS users. There’s the stuff that we’ve already covered: card-grouping Stacks, enhanced and more capable Just Type with search and Quick Actions, Exhibition Touchstone dock modes, and expandable Synergy plug-ins. webOS finally supports Adobe Flash Player 10.1 (beta), and it comes baked right into webOS 2.0. Flash support is limited to the browser, but by and large it’s a rich and fluid experience, and one that we’re glad we can stop wondering if we’ll ever get. You can now tag contacts as a “favorite.” Doing so has two consequences. One: the contact will show up under the new Favorites view in the Phone app. Two: contacts tagged as such will appear at the top of searches in Contacts, Email, Messaging, and Phone. 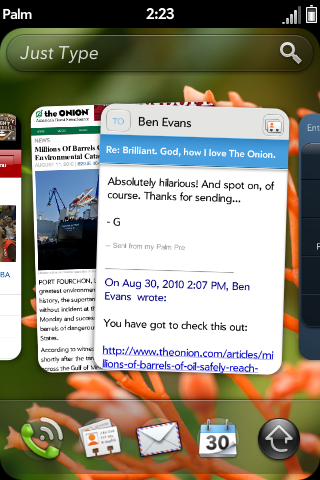 As glimpsed in earlier leaks, webOS 2.0 comes along with Text Assist. The new app and service build upon and greatly expand the auto-correction capabilities of webOS, including general spell checking, dictionary customization, and the ability to set your own macros (custom text strings with a short typed trigger). Skype Mobile is coming to webOS, so long as you’re on Verizon. This leverages that exclusive Verizon deal, so don’t count on seeing Skype calling on any other webOS devices any time soon. The new Quickoffice Connect Mobile Suite is included from the start, displacing DataViz’s abandoned Documents to Go package. But the only thing you’ll get by default in webOS 2.0 is the Quickoffice viewer, which lets you read Word, Excel, and PowerPoint files. There’s no editing just yet (we suspect Quickoffice wants to charge for that, which is reasonable, albeit disappointing), but the included app does sync with online services like Google Docs and Dropbox. The Facebook app is also getting a bump to 2.0, which brings along support for Facebook Chat in Messaging, through the magic of Synergy. The new Facebook app also leverages the other new webOS tools, like Stacks, Quick Actions, and Exhibition. And that's just the beginning - explore the world of webOS 2.0 updated features after the break. The Web browser now supports more HTML5 features, including geolocation, so you can get your online mapping and location-based services action going with ease. Also added in is OpenSearch plug-in support, which will allow you to add your favorite website searches to Just Type search. Visiting an OpenSearch-enabled site (like PreCentral) gives you a notification that you can add this site’s search to Just Type. Easy as pie. Messaging has picked up Yahoo! IM, leaving Windows Live as the final major chat platform not available to webOS users. The new VPN app allows for connections to all variety of VPN networks (including IPsec and Cisco AnyConnect). The App Catalog has been revamped to make “finding and discovering great apps even easier.” There’s also a new Software Manager to help you, well, manage your software. As we saw earlier, the launcher has been redesigned to enable users to add, label, and reorder pages. Also changed is the behavior of the dock, with apps added to the dock staying in the launcher, and the dock disappearing when the launcher is brought up. The phone app has been revised to offer access to the above-discussed Favorites, as well as now offering reverse area code look-up. A new Accounts app provides a single location to manage all of your Synergy accounts (finally). Bluetooth support has been expanded to enable both Bluetooth keyboards and Bluetooth SPP peripherals, like barcode scanners and realty lock boxes. And yes, we said HP. The mothership has made the branding official, this is now HP webOS. An exact release schedule for webOS 2.0 has not yet been released, though we would hope expect it too be available for all webOS devices in the next few months, if not sooner. At the very least, you can get it on your SFR Pre 2 if you’re really hankerin’ for some 2.0 action.